for you can visualize the beginning of the world, so simply trace back in a linear way to the very beginning of where you think source exist and what do you find? and ask yourself upon finding this answer in your mind "what was before this? ", and than on the second answer ask the same "What was before this?" I was fearful,I didnt want to have to endure the sorrows of life,the physical pain that dwelled in my mind. The companions gave me the strength to return to the world. Although this meant that I had to re-enter the world,through the underworld,the astral plane. A place that was not stranger too me,for i had started to travel the astral plane when I was still in my crib. I wasnt able to say my Name,I had speach problems,english was a hard language for me too learn. The doorway of the world was swung open when I had nearly died at the age of three years. The companions,They gave me a Mother and Father-Parents. Your imagination and ability to string words together a pleasure to read what you have to say re the astral plane 4th dimension that overlaps our 3 D physical plane Earth that is also being overlapped by the 5th 6th and 7TH.....is exciting 'time' to be alive.....please stop being fearful.....we are here in body on an adventure....of Dimension jumping to the ships in the sea of vast Space ....is what the LTO wants of us....replace it with being fearless......and everything ....I assure you......Wing Maker Will......work out ok,,,,..it trumps time.....First Source rule.....even Vampires . You know deep down you wish to be free of them ....and now being not only Rosh Hashana....but Beltane too.....its a perfect storm kind of day....to do so .....Portals abound.....they are everywhere you look....many Souls want to be set free......being fearful you attract fear.....that is induced even further by it being broadcast by the PTB that do not wish the status -quo to change......just let go of the fear....things are going to get better....maybe a simple change of the diet....is all that is needed.....are you doing any Yoga.... helps balance and spin the chakras in the right way Zoa. I have been listening to the weather reports,we had two tornatos. I just got back to Texas,was gone for a few weeks. I was in North Dakota,it snowed. It was 90 degrees today,my door is still open. Going to Ark. tomarrow. I might be and Washington by the end of the month. I have been to nearly every state and the usa this side Mississippi. I have been through hells stroms,high winds and tornatos. I have seen some outrageous thunder stroms. So is the life of a Rveer. Trailer parks,and hotels,truck stop food,and mickydees. My Mustang needs to be detailed,the car wash isnt working anymore. Gas prices are ah soaring-4.29 a gallon. Mac and cheese 2.09 cents. People taking about God in the parking lots of wally world,with their end time gloom,and jesus Loves me,IF? 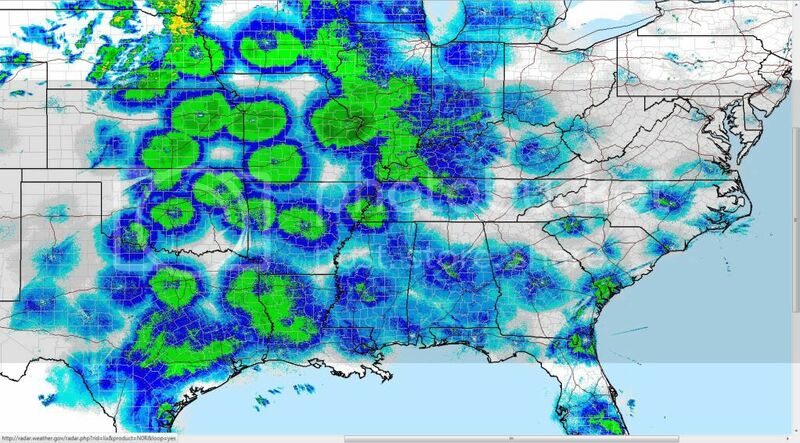 Some claim these are HAARP "rings" and that in the next few days we will see another batch of "super cells" form in the mid west ... others believe it is "normal" even though no one has ever seen anything like this as longs as weather reports have been issued ... discern for yourselves ... If we have another "episode" of these super cells, I believe it will be revealed that what or who ever is causing these anomalies, is not "normal" and that because, these events can be made to appear like something "natural" that most people will "blame" it on Nature ... but I trust Nature - I believe that we created it - to assist us, not to destroy us ... so when something as massive as FUshima and this happens and creates a scenario that throws us backwards, instead of forward, that it is a good indication of someone working to reverse our progression as a species - and I don't believe Nature works that way . now they don't have to bulldoze the empty houses down ... the banks can collect insurance on them instead of taking a complete loss ... I don't know about the rest of the states ... but Colorado has remained pretty untouched by the economic slump - because home prices weren't that inflated to begin with ... but just in Colo SPs we have six thousand homes in foreclosure ... so I can just imagine how many empty homes there are sitting all across the Mid West ... or perhaps where these "rings" are appearing ?? getting back to the topic ... of course Time exists ... MEST is our "dominate" reality whether or not we choose to explore the other "realities" the fact remains that our present HMS in incapable of handling more than one reality at a time - that is just how it was designed (to keep us focused) - which is not to say that we can't "visit" other realities, but that this reality is dominate until we restore our original configuration of the SECUs template - before it incarnated here, which will allow us to comprehend the other realities ... we can "go there" but what purpose does it serve if we can't comprehend it? I believe that "full consciousness" is a state of being that allows for MEST to be what it IS and that it is totally comprehensible even to the typical human ... and that it serves a purpose by being fragmented into various "dimensions" - which is to prevent us from being overwhelmed by All that Is, when our consciousness is fragmented ... and once we accomplish that purpose, as individuals, that we can can collectively expand and enhance our personal state of consciousness that exists in the MEST - by blending these now separate "dimensions" and experience in other "models of existence" while remaining in this "dominate" reality - that there is no need for us to "go there" when we can bring it here and experience it, in a way that is comprehensible to the HI. to perhaps make this more understandable ... pretend you are going from point A to point B ... and that you have an entire lifetime to get there ... the journey is acomplished one step at a time ... but there is nothing that says, you can't ride a bike, or drive a car, or take a plane - once that "advanced" technology is introduced ... but as soon as you alter the time it takes to traverse the distance (with advanced technology) you cheat yourself of the experience you may have gained by exploring the landscape - one step at a time ... even stopping to smell the roses. with (advanced) technology we can get there faster ... but it doesn't really allow us to experience what we set out to experience - which is all that is ... if we fly right over the Rockies, we will be dependent upon others to tell us what they "were" like but it isn't going to be the same experience that YOU may have had if you had walked across them ... your "shared" knowledge doesn't include the smells and sounds of being there - the taste of the water, the warmth of your campfire ... your breath (life force) is not blended with the Rockies' rarefied air ... you miss what it has to contribute to your existence, and it misses what you had to contribute to it ... the world remains in a state of separation, when you had the opportunity to BLEND numerous realities into one that could be shared, enhanced and expanded to include the other. MEST existed here - before we were even created and will exist even if we abandoned this region of the Universe ... we came here to explore it ... but in order to do that properly, we need to do it - one step at a time - (pun intended) Time, Matter, Energy and Space are not part of the illusion ... they are the reason FOR the illusion (so we don't miss a thing) ... and we were progressing nicely until Anu came along and altered the HMS to serve himself. Wow how the heck did you knowwhat i was going through Markzorb! Brother.....all I can do is if you have not yet........begin to read the newest work by James.....as It is at some level that does encompass this dimension unifying everyone of us....enjoy and savor each word. what do you mean by vampires exactly? welcome to the WMF steppingstone, where we discuss the Wingmaker's materials ... which revel that channeling is a practice limited to the realms of the Human mind ... that Anu created to keep us distracted and to transfer and upgrade his evolving programs in the Human Mind's systems. There is no such thing as a "higher self" ... but the Wingmaker materials offer one the opportunity to expand and enhance one's consciousness, by restoring the wholeness of the Self ... with the integration of all its components (Soul/individuated consciousness, Remnant Imprint/muse for inspiration, Phantom core/heart's scribe, Wholeness Navigator/soul's heart) within the Human Instrument, resulting in a Wholeness Perspective that allow the Entity to gain the state of consciousness of the individual, known as the Sovereign Integral (which is unique for each of us) - which gives it access to the collective Intelligence of First Source - once the rest of our DNA has been activated . Answer 11 from James: Channeling is a sub-component of the God-Spirit-Soul Complex (GSSC), and therefore the Human Mind System. ... Channeling was originally the equivalent of demon possession where interdimensional entities would temporarily infuse themselves within the human instrument and read a script prepared for them, usually an operative of the GSSC who was intent on bringing hope, love, truth, wisdom, and cosmological indoctrinations to humanity through the spiritual and, to a lesser extent, religious systems of the human family. In more recent times channeling has become more automated, using pre-programmed scripts, voice tonalities, gestures, and accents which are implanted in the HMS of the individual channeler, and quite literally “broadcast” for later publication and dissemination among those who have a resonance to GSSC and seek enlightenment therein. The channeled materials, owning to their extensive crafting, were cosmological wunderkinds that generated awe and near-instant faith in their readers. Works like The Urantia Book, Conversations with God, Seth, Agartha, Alice Bailey, and countless others were all prepared texts for humanity, written by dimensional entities under the direction of the GSSC and distributed for human consumption to ensure that humans remained satiated with division and deception – though under the guise of spiritual and cosmological truth. of course you may believe it or not ... it is always your choice. 2. Frequently addresses audience as "dear ones." That being said, everyone has their own path back to Source, and the above icon may be pointing to a "trail marker." Bless us all, and watch out for vampires! You are indeed demanding connection with a "higher self/higher intelligence", but it is your "higher self/higher intelligence" that you should place your focus on friend, not anothers. Quote from Event Temple Session 1. "Now, imagine the intelligence and creative capacities of your Higher Self and the Spirit Energy in which it lives ... is poised ... prepared ... and waiting." Then ask yourself, and Lincoln, these questions friend? Who is Lincoln? Who are you? This is in no way disrespectful to Lincoln, for Lincoln could quite likely be asking you, and himself, the same questions? apparently you missed the message in what I quoted ... channeling messages from the MIND - that can produce anything you desire to hear, and was created to serve the Annunaki's agenda - is not helping you progress - it is distracting you and is SELF-defeating and supporting deception ... why would anyone want to participate in that ... why would they surrender to this type of enslavement which diminishes their ability to be who they are? You are the only one who can save yourself ... you have everything you need NOW to do that, without becoming dependent upon external sources ... not even if they claim to be your "higher-self" .... masters, gods, or Light. The Wmms simply remind you of your potential to serve a higher purpose - as a Sovereign Integral. When ‘something’ comes to me, I tend to look at the message rather than the way it ‘came’.... to discern the truth in it and the relevance to ‘where I am in that moment’. From very young I have felt responsible for my ‘path’ and appreciate the assistance that makes its way to me. It seems that there are different perspectives to ‘sit’ within and one of those perspectives may look for ‘messages’ from outside where another feels from within. There is nothing to be ‘chastised’ for in this but it feels good to have a perspective on it. Why not ‘move into’ the greatest perspective that we can? Something beautiful about these materials, to me, is that they are empowering us to recognize our capabilities and magnificence. We have direct access to all we wish to ‘know’.... We just have to recognize and embrace this and it seems to require that we ‘step outside’ of what we have been ‘taught’. When we 'step outside' of any perspective aren't we stepping outside of 'time'? Just my thoughts. Thank you for this discussion. Last edited by Karen on Mon Jul 11, 2011 1:22 am, edited 1 time in total. yes, I agree with your perspective of "stepping out of time" ... and see how stepping into one's own mind, would be one way to do that... but we might also want to remember that the Mind is programed ... and depends upon experiences from the Past to determine what actions it will make now. It refers to "learned behavior" ... word associations ... and emotions (feelings) - and will avoid what it perceives are "mistakes". It is limited to the Human Instruments "senses" to detect deception ... and it is very much influenced by the HMS's programs... designed to conceal our true identity. Channeling reveals one's mistrust of their Self - when the individual chooses to believe that someone else knows (or has access to) something they don't or wouldn't know via any other means. They never question the messengers ... they unconditionally accept that they are whomever YOU choose to lead you ... which is very easy for these Agents of Anu, because they can "read your mind" - and even if they couldn't, the fact that you are in their world, proves to them that you ARE seeing "outside" help ... and willing to surrender to their "higher knowledge" - without questioning their source. They are well aware of why you seek to be a channel ... and that it is part of the HMS program. We created the minds ... we are not that which we have created . Anu wanted to ensure that spiritual and religious seekers would be caught up in the heavens of his creation. This is why the search outside oneself is so powerfully encoded, why we feel this separation of body and soul, and soul and God; why we cling so tenaciously to the diluted and disempowered versions of First Source, Source Intelligence, and Sovereign Integral found in the God-Spirit-Soul Complex; why our thoughts and prayers, so filled with hope, speak to a mask of First Source that is not one and equal with ourselves. why are we all here talking directly to each other about this and about that, unless it was to share and enjoy our experience of life, and at the same time maybe grow a little more in understanding and happiness. are we all stuck in survival mode where we think we have to do this, probably not. How can you be the timeless self in the world, but not of it, not of time. when you are hungry you eat when you are tired you sleep, when someone is crying for help on the street you help them as best as you can, yet you always have the free will to step out of the flow of your life and just be, just know yourself.